Although we don’t agree with everything in the piece below, we decided to republish it. It gives an idea how people from the broader movement think and how they debate. The many qoutes from corporate media are irritating and we want to stress that for us nonviolent action is one of many tactics. Not more, not less. Originally published by Extinction Rebellion. How do you get from those walking en masse from poverty and repression in Honduras to the US border to the effects of climate change in Bangladesh and back again? What do these two seeming unrelated situations mean for acts of non-violent, civil disobedience? For us? Well, let’s start with this little observation; “With the rise of Sea-level up to one meter only, Bangladesh could lose up to 15% of its land area under the Sea water and around 30 million people living in the coastal areas of Bangladesh could become refugees because of climate change impacts.” As recently as last year over 800,000 Rohingya were forcibly expelled from Myanmar into squalid camps along the coast of Bangladesh in the Bay of Bengal. These camps are places they are now going to have to call home for a very long time. 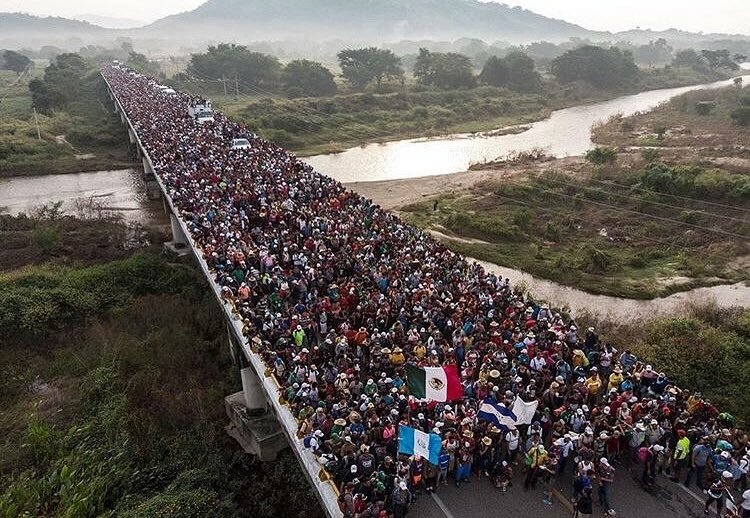 Now turn to Honduras where the US president has used the mid-term elections to vilify the approaching 7,200 person strong caravan as a threat to national security. The idea of the caravan was developed as a direct action response by activists working on migration issues seeking ways to delegitimise the current right oriented government. The organisers are probably overwhelmed at what the caravan has become, possibly even shaking their heads in disbelief. Those walking the 2446 kilometre route are fleeing poverty and violence at home and dreaming of better, safer lives for their families in the US. The response from the US has been a threat to cut international aid to Honduras, as well as reinforcing military units at the US border. The EU experienced its own wave of irregular migration in 2015 and almost fell apart at the seams trying to stem the flow of one million plus asylum seekers and migrants to its shores. The EU and its constituent countries have tried multiple methods to keep people away, for example by attempting to introduce a quota system to ‘manage the burden’, by doing suspected bilateral deals with Libyan militias to retain migrants in countries leaving them open to risks of abuse, kidnapping, torture and being sold into slavery, and through the much-vaunted but ethically dubious EU Turkey deal, which ships back one Syrian refugee who entered Greece irregularly for one who has legally entered the asylum process in Turkey. The Honduran caravan is a great example of non-violent, civil disobedience in action. Just 7000 people who moved collectively garnered (a) sustained media coverage of their plight (b) a number of governments scrambling to manage and contain public opinion, including the Honduran State, and (c) public sympathy to a greater or lesser extent depending on which country you are sitting in but either way they have polarized the issue in people’s minds. That’s a lot of power granted to very few people, who are often travelling with little more than the shirts on their backs. The caravan is disruptive and testing the ability of opponents to function, this we can clearly see in governmental responses. The large scale migration flow into Greece and Italy severely tested the supranational EU’s ability to function and still does. That said, these movements are very high risk and can fail, in many cases ending lethally for the participants, but activists can draw significant lessons from witnessing how the actions of a few people, who in this case are the so-called dispossessed, can shake the systems of the mighty. Marches like this can work to shift public opinion on the thorniest of issues if those involved remain committed to the principles of non-violence. Those working to support all refugees and migrants on the move would do well to start building the case for the impact climate change is having on their reasons for leaving home in the first place. They should also seek to build alliances at all stages along their route with the broadest range of actors possible, not just the usual suspects like civil society organisations, legal groups and religious leaders but also municipalities, local business owners and small to medium enterprises, even taxi and truck drivers who often know smuggling routes and the dangers within them better than most. A broad coalition of support can protect activists from harm, motivate others to join and counter negative and alarmist arguments by those who seek to control a situation through division and fear. A broad coalition of support will legitimise civil disobedience. Some have equated the caravan with the spirit of the 1930 salt march in India and though this may be a stretch it is a comparison that is not without merit. One of the key principles of non-violent direct action is unity. Successful campaigns require the participation of a diversity of political, social and economic and groups and sectors of society, because by definition a movement’s legitimacy and strength lies in its mobilization of large numbers of civilians, this usually requires a coalition of groups and organizations. That is the unity of people. The Hondurans are marching because they also have a unity of purpose that allows them to make sacrifices for goals that are meaningful to their daily lives. Climate change will push more people to collective actions of civil disobedience in order to provide what they believe is best for themselves and their families. The Internal Displacement Monitoring Centre (IDMC) estimates that in the 6 years between 2008 and 2014, an annual average of at least 22.5 million people were displaced by the direct threat or impact of floods, landslides, storms, wildfires and extreme temperatures. If the sea levels rise as is being predicted in Bangladesh, the Rohingya, unwanted, stateless and unloved in their former and current homes, have little to lose in getting on the road and marching too. I, for one, hope it does not come to that and that through the actions of Extinction Rebellion, others are marching for them so they may never have to. We (Enough is Enough) need your support: You can support our work by ordering a hoodie or t-shirt in our shop: here or donate. Crowdfunding campaign for the Enough is Enough Info-Café: here.